Did you know Colorado has a rich and lengthy history of wine making? 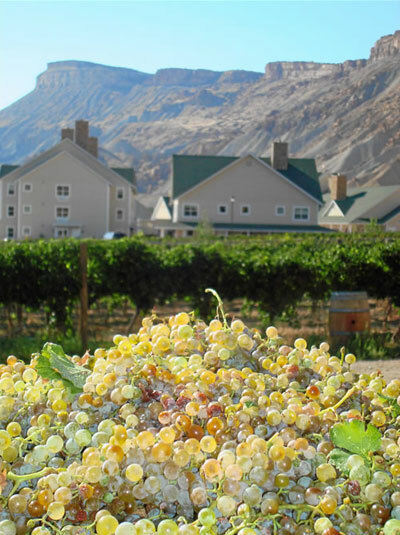 With nearly 60 vineyards across the state, the largest concentrations of grape growers practice their craft in the picturesque, little town of Palisade.Surrounded by magnificent mountains and breathtaking vistas in every direction, the grapes flourish in Palisade’s temperate climate and rich soil with the help of the Colorado River running through it. Beginning in 1894, the area was called the Vinelands with peach, pear, apple and grape orchards its’ major industries. Palisade is now known as the Peach and Wine Capital of Colorado. 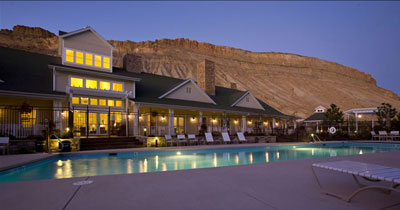 When we were invited to visit nearby Powderhorn Mountain Resort, a stay at the Wine Country Inn in Palisade came highly recommended. Named as one of the top-ranked hotels on Expedia Insiders’ Select List and one of the top 7 U.S. vineyard properties in the U.S. by Wine Enthusiast Magazine, it was easy to see why. Driving up to the property, we were immediately drawn in by the charm and peacefulness of the hotel’s Victorian architecture, nestled within a 20 acre vineyard with towering vistas to its’ North. Not to mention, wine tasting just happens to be one of our favorite activities. Every afternoon the hotel hosts a wine reception in its’ inviting lobby, where you can sample Wine Country Inn’s very own label. Even our five-year-old daughter enjoyed the reception, as many families were gathered around the lobby’s grand fireplace, sipping wine and socializing. Our daughter fell in love with the staff, which went out of their way to make sure she and the other kids were entertained. Right off the lobby is the Tapestry Lounge, offering Tapas and light dining in the evenings and a complimentary full breakfast buffet in the mornings. We partook of both and were not let down. The breakfast buffet has to be one of the best I’ve ever experienced in terms of selection and freshness, and dinner was just as delicious. It was nice to be able to order a bottle of wine with dinner, made from the grapes grown right there on the property, and then finish it at our leisure back in our room. They even re-sealed the bottle for us with a special airtight rubber cork. We always appreciate a room with refrigerator and microwave – just part of what made our room a comfortable retreat after a day on the slopes at Powderhorn. And, every room has an amazing view, something we always enjoy waking up to. In addition to 80 hotel rooms, the Wine Country Inn also offers accommodations for larger groups, such as wedding parties, family reunions, girlfriend getaways, corporate retreats and other events in the Vinter’s Guest House. If you’re still looking to getaway for a ski vacation this Spring before the snow melts, check out their Ski and Stay Package which includes lodging, two adult full-day passes and transportation to and from Powderhorn. Chris is a designer, WAHM and pilot’s wife living in Colorado. She writes as Standby Traveling Mom as well as at MamaBirdsBlog.com. Follow her on Twitter as @BirdBanter. 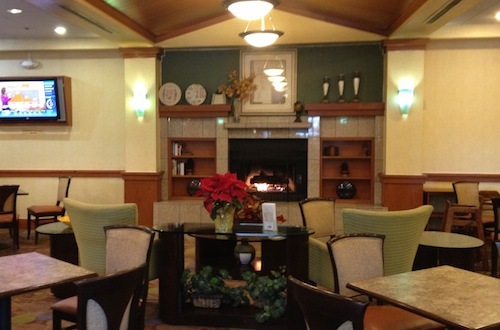 Disclosure: Colorado Wine Country Inn hosted us for the purposes of writing this review. No other compensation was provided. All opinions expressed are my own and without influence by the Wine Country Inn. Christina and her family take advantage of her husband's airline employee standby privileges whenever and wherever they can. Even flying as far as Denver to Dubai and back on standby passes. Traveling across the country is currently taking a back seat to discovering all there is to see and do in beautiful Florida though. But, with Orlando as their jumping off point, more travels to new destinations are never off the table!